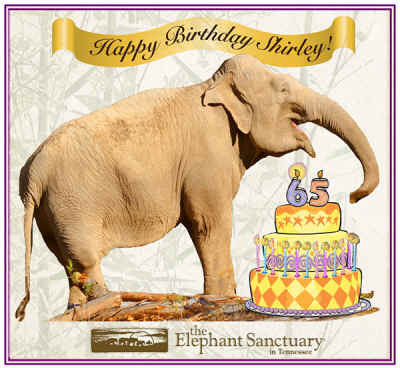 We are excited to be celebrating the 65th birthday of one of our resident elephants, Shirley! We invite you to be a part of the festivities on July 18th, 19th, and 20th at our Welcome Center in downtown Hohenwald. Shirley’s three-day birthday celebration commences on Thursday, July 18th with Family Day. Our Welcome Center will be open 11:00 am to 4:00 pm, with hands-on activities for the kids, readings from When Anju Loved Being an Elephant, and live streaming video of our Girls in the habitat. On Friday, July 19th at 2:30 pm we will premiere the movie Shirley; An Amazing Life, popcorn included. And on Saturday, July 20th we will host Shirley’s birthday party, with cake served all day, door prize drawings every 65 minutes beginning at 12:05 pm, regular showings of videos about Shirley, and a presentation from Shirley’s caregivers at 2:30 pm. The Welcome Center and gift shop will be open 11:00 am to 4:00 pm each day. Please let us know if you plan on attending! Send Us Your Happy Birthday Wishes For Shirley! Join us in celebrating Shirley's 65th Birthday by sending your biggest and best birthday wishes! Design your own Happy Birthday sign for Shirley, then hold it up for the world to see, take a picture, and email it to us at [email protected] The photos will be included in a special birthday slide show to be displayed at our Welcome Center during Shirley's Birthday Celebration on July 18th, 19th, and 20th. We will also post them on our Facebook page in the "Birthday Wish of the Day" feature beginning July 1st. Shirley is our oldest elephant, wild caught in Sumatra over fifty years ago. Her back right leg was broken thirty years ago when she was attacked by a fellow circus elephant. She is missing a large section of her right ear as result of a fire which not only injured her ear but also left several scars on her back, side and feet.